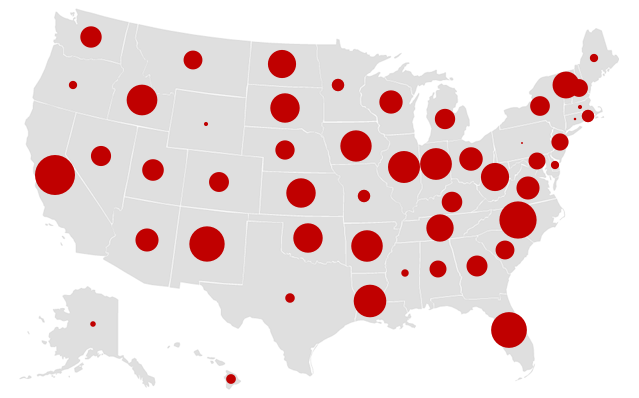 I spent some time this evening with Nodebox and "Visualizing Data" by Ben Fry. I did encounter a couple of quirks and a few things i needed to re-implement in python, but i managed to get through the first couple of example applications in the book. Basically, i can load the map graphic, load the center point and the random data tab-delimited text files and plot circles on the center points of the map. the Table class from the book was ported (mostly) to python. The API is a bit simpler since python is more flexible with types. processing.map - Takes a value between 1 range of values and maps it to the equivalent spot in another range. This method is poorly named since python has a map method that does what a programming language should do for map(). The processing module will hold most of the stuff i needed to reimplement from processing. I have posted the Nodebox Project and required libraries for you to download and play with. I should probably clarify the license on this code and put it in version control, but that is a task for another time. I have played around with processing on and off for a few years now. setpixel told me about the app pretty soon after it came out. I have never spent much concentrated time working with it, though. This year, at pycon, i learned about NodeBox, which is essentially processing for mac os x using python instead of java. I have also dabbled a bit with that app, but to no real end. I have a copy of Ben Fry's new book Visualizing Data and have been reading through it every once and a while. I decided today to try to work through that book and translate the examples to python along the way so i can learn nodebox a bit better and get through some more hands on processing work. This morning at the coffee shop, i made a quick example app to run in both nodebox and processing just to get things started. 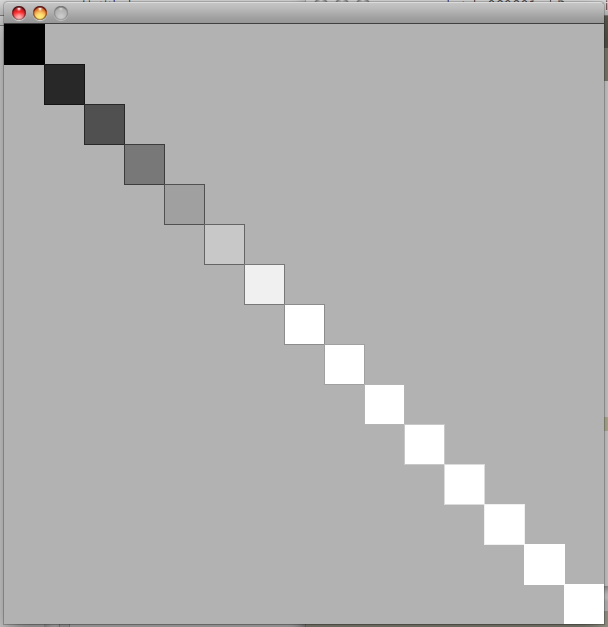 The design is a simple stairstep of squares with changing fill and stroke colors. Even this simple application shows some interesting differences between nodebox and processing (as well as java and python). While this sample design is very simplistic, there are a few interesting points that i learned while making this example. processing will not automatically cap color values at 255 if given numbers > 255, so i needed to make the ceiling() function to keep the behaviour between processing and nodebox the same. nodebox has a richer rect() method that lets you specify corner radius. The stroke will follow the corner radius settings. I haven't dug into processing enough yet to figure out the equivalent method for drawing rounded rectangles, but it is definitely possible. 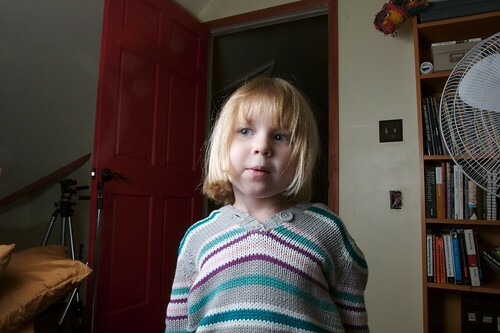 ava and i made a video tonight while juliana was at a sleepover. MacHeist is a sale that is running right now (the deal ends on january 23rd) that packages up a bunch of great independent mac software for a bundle price of $49. Now, this is a deal in and of itself (some of the software goes for more than 50 dollars by itself), but you can elect to send 25% of your purchase prices to one or all of a set of charities listed on the site. As of right now, they have raised $75,000 for charity and if they hit $100,000, they will also add PixelMator, the really lovely looking, layer-based image editing application, to the mix. So if you are reading this and have a mac, what are you waiting for??? If you want to give this deal a shot, you can use my referral link. DDJ Architecture & Design World: Randy Miller's "Agile Architecture"
Randy (Granville) Miller is an architect for Microsoft. He has a Microsoft blog. Last week i attended his session, "Agile Architecture" at the Dr. Dobb's Architecture and Design World Conference. His talk started with a quick overview of agile and its benefits. As a side note, i was amazed at how much of that talk was happening at the conference. I assumed (there i go again) that it was so prevalent now that it was roughly a given. Apparently i assumed incorrectly. My bias in writing XP originally was towards the programmers. That’s my background. That’s who I identified with on teams. However, the past five years have taught me that software development can’t be “the programmers and a bunch of other people�?if the goal is excellence. Without balance between the concerns of everyone involved, some people will be unable to contribute to development, and their views are important to the team’s success. My team's nearly 2 year experience with Scrum has certainly proven this out. In fact, Scrum's biggest benefits have materialized in communications and project management benefits over strict engineering benefits. While combining multiple roles on a single team is a fundamental agile tenet, the role of Architect is not often discussed and less so in an Agile Context. XP, Enterprise Scrum and Microsoft's MSF stuff were mentioned as methodologies that discuss the architect and architecture. The notion that architecture was unnecessary in an agile project was brought up as a fundamental myth about agile practices. After nods all around, he made his first suggestion: build stories to verify the architecture in a deployed sense, not on paper. For a client server application, build the client and the server with a really simple interface or a stub, but make it real. Put it in your environment and let it run. The appeal of making a design tangible is pretty interesting, even if it gets difficult for a lot of cases. The rest of his presentation focused on the concepts of shadows. Working or existing code can cast what he called "Trailing Shadows". Reverse engineering databases into ER diagrams, java code into UML diagrams, etc. In my team, this has been incredibly valuable. It is a common sense task to take stock of what you have and document it, but i really like the term Trailing Shadows as an indicator of architecture. The mixture of a legacy code base and an expanding engineering team makes that particularly necessary for my team. On the flip side of that, he talked about "Leading Shadows" from a design. Our leading shadows could come from whiteboard sketches, notebook pages, quick visio diagrams, etc. He stressed that these shadows should turn into working code within an iteration and not devolve into Big Design Up Front. Following on this discussion, he stressed building scaffolding for these sketches, writing tests for them and getting them into your continuous integration environment. 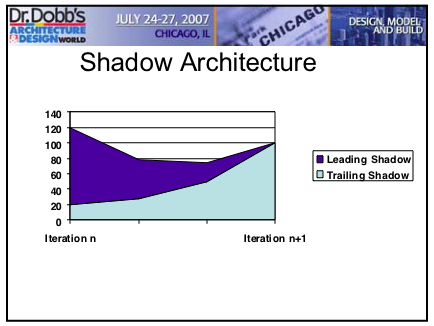 A chart from his presentation shows the ideal progression of leading and trailing shadows over the course of a project. As part of a retrospective after an iteration, review the shadows, suggested Miller. If you have leading shadows still, you need more development. If you have trailing shadows, then you are done with this architectural change. The final interesting part of the talk was a focus on the inverse relationship between project size and the length of iterations/integrations. He gave an anecdote about the size of the team for the last Visual Studio release (~4-500 developers) and the 2 month iteration size. They found that they spent a ton of time doing integration testing and conflict resolution. This seems like a no-brainer, but is often hard to put into practice. The shadow architecture concept is part of the Microsoft System Foundation for Agile Software Development. On that basis, i am going to do a little reading on that system. I don't develop for windows or use Visual Studio, so we'll see what is applicable. Miller's talk was one of my favorites at the conference and helped me get some perspective on the "What is my sprint to sprint role as an architect?" question. His speaking style was great, the presentation flowed well between his material and the audience questions. I spent most of last week at Dr. Dobb's Architecture and Design World in Chicago. While the name caused some of my colleagues to snicker, the conference had a great schedule, so i signed up. Before i talk about any specific talks, i have a few comments on the conference itself. The food and drinks could have been much better. Coffee was scarce and competition for a cup fierce. The boxed lunches got old quickly and there was no breakfast served, despite 8:30 start times for 3 of the 4 days. Many talks needed a quick test before attendees were allowed to ask a question. Too many questions in talks with the word "agile" in the title either complained that agile was too hard for their app/company because of INSERT REASON HERE. Much of the talk was about finding a place for Architecture in a process that is often interpreted as meaning, "Look ahead only 1 or 2 iterations. As long as we do test driven development, a quality product and architecture will emerge." Various speakers and attendees addressed this differently, but the conversation was very interesting. I left the conference with several pages of notes to work through from many great talks. Here are just a couple of notes. My favorite practical talk was Neal Ford's "Building DSLs in Static and Dynamic Languages" (download Neal's slides (pdf). Neal walked through some background on DSLs and then took 3 approaches to building one: building fluent interfaces (think method chaining) in Java, a Groovy example that cleaned up the java syntax and finally a Ruby DSL. He stressed knowing the syntax you want to be able to write and building towards that. Neal was a fantastic speaker and the session was a lot of fun. Scott Ambler's keynote "Evolving Agile: Time to Address the Uncomfortable Issues We’d Prefer to Avoid" focused on the results of a recent Dr. Dobb's survey on agile methodologies. An interesting takeaway from his talk was the prevalence of modeling practices (from whiteboard to formal tool) in teams reporting successful agile projects. Scott focused on simple techniques and a sort of just in time modeling done at the beginning of an iteration for a limited scope. Randy Miller from Microsoft gave a great talk entitled "Agile Architecture" and focused on guiding teams towards an architecture without resorting to big design up front. Modeling was a key technique he used, but as with Ambler's talk, common sense was the main rule. Model what you need to model to show what you have and where you are going based on what you know now. He also told an interesting anecdote about the last Visual Studio release. They had 4-500 developers working on 2 month iterations that resulted in a ton of time spent dealing with integration. The newest release that is in progress has apparently moved to shorter iterations. I will be presenting some of my notes and thoughts to some of my coworkers in the next couple of weeks, so i will post some more info about specific topics and presentations over the next few days. 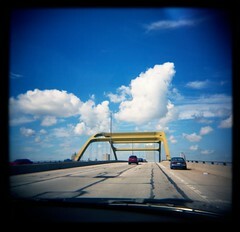 Since we live in Bayview, we end up using the Hoan Bridge quite a bit. It is a cool bridge that has a lot more history than i realized. I had always recalled hearing the Hoan called "The Bridge to Nowhere" (immediately causing the Talking Heads song "Road To Nowhere" to nestle into my brain), but i didn't really know the full story. While searching around for the proper spelling of the Hoan (Hohne? Hohn? Hone?) i came across a more elaborate history of the Hoan Bridge at the Wisconsin Highways web site. Pretty neat stuff. I had always thought that the bridge was only completed in the 21st century, but I was wrong. A section collapsed and was brought down for repairs in late 2000. Crazy! I snapped these two shots off the bridge on a recent trip to the park with the girls. Ya gotta love the Holga + really old neg film + brilliant blue + good scanner combination.